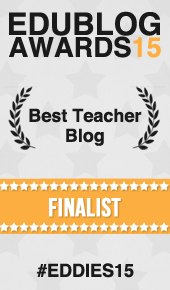 How technology is helping me learn, and why schools are slow in transforming! My new project is getting students and teachers to share how technology is helping them in their learning, at home and at school. To see if there are any differences between work at home and at school, and to learn from students and educators in different countries. Please answer the survey using this link! My students have started writing about this on their blogs and we have comments from South Africa, Australia, Alaska and Greece. I’m looking forward to the conversation and to see the similarities and differences between these countries, continents. After writing and discussing this topic online, we scheduled Skype meetings between some of the students in Australia and Norway during the evenings since the time difference between these continents is a challenge. All our schoolwork is done digitally through e-books online and OneNote. In most cases, this is actually rather great. It is a lot less of a burden traveling to school, as the sleek, lightweight computer is a lot easier to carry. There is no need for any kinds of books. As I stated in the paragraph above, we read our textbooks online. This too gives us advantages, because in addition to reading the curriculum we can also listen to it. The site, called Unibok has recorded all the subject material and lets us easily jupm back and forth. Yet another supplement is that one can search for words, and the site will list up every page where that word is stated. This makes it so effortless to find the things you are looking for. We use technology in all classes. For example, in Spanish class we use something called “Duolingo” and “Quizlet”, different websites with exercises to learn Spanish grammar, new words and phrases, to mention something. The use of technology gives us lots of opportunities and we are lucky that we get the chance to try out this method of learning. Still, I think the use of technology unfortunately takes a lot of the attention from us students, and we can easily get distracted for instant by Facebook and other social medias. It can definelty make us loose focus. This year 90 first year students at Sandvika vgs are testing the use of textbooks on the computers. Originally we asked the parents to buy tablet pcs, and our county to help us with funding, but both attempts were in vain. 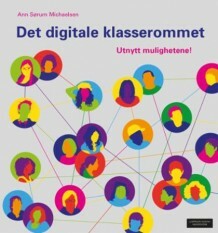 Our county “Akershus fylkeskommune” did not see the value of testing computers that differ from the standard they have chosen for their schools. Our students are stubborn and most have persuaded their parents to buy Macs. Why is this a problem? After all, we have BYOD here! Firstly our teachers use PCs and are not able to help students with their Macs, secondly, we believe that the ability to take notes with a pen is of great value, and also the fact that you can put the computer down and write on it as if it is a notebook. Even so, all my students seem very fortunate to be able to work this way and I will share some of their reflections below.I think our takeaway here is the following. Books online will in time replace textbooks as we know them, and students appreciate the ability to have sound and video integrated online in the books. We as teachers and adults have to control the use of internet in that we talk to our students, discuss the dangers of distraction and sometimes block the internet. One student also points out “that we don’t take notes by hand. It is scientifically proven that when you write with your hand, you learn more”. This just underlines the point I was trying to make earlier. I hope parents read this and consider a tablet pc next time they buy a computer for their kids. 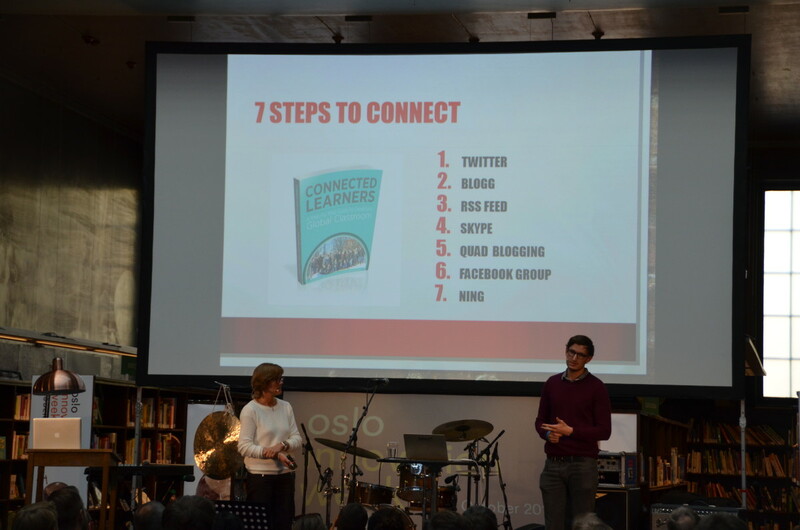 Last week I was able to speak at both Ed-tech Norway Wednesday and Thursday to a smaller group of engaged people representing principals and publishers in Oslo. Both experiences were good, the first because I was able to present with my students and the latter because we had some interesting conversations around schools and change. I managed to annoy the publishers when talking about teaching without textbooks, and for that I apologize. I’m looking for the perfect solutions and as I have pointed out on so many occasions, one size never fits all! What works for me might not work for you, and we should be albe to choose accordingly. Learning is the keyword and I strongly believe that learning takes place in schools when we work ith others, collaborating and communicating, and using tools and sources that are available and adapted to the individual student. Here are some points I found on this website: Ipad4schools. Your Principal is NOT seen by the teachers as an equal participant in learning. The article ends by saying and I quote: Adapt or loose your students. “More and more students are dropping out of school finding alternatives way to get an education finding alternative paths to early success and careers.” So true! Schools need to wake up or they will loose their students. I’m sure few educators and school leaders in Norway agree with me on this, but I’m pretty sure it might happen. If the 5 points above intrigue you, I suggest you read the whole article here. And I recommend that you watch these videos too. Previous Post: Stop Googling. Let’s Talk. Next Post: Looking for ways to change your classroom? Hi, Ann my students use computers daily in class but last year I showed them Sketchnoting to take notes as I had read that hand-written notes and drawings benefit learning and memory. My students have then used these images on their blogs to introduce their topics and to create their own copyright free pictures. With my ESL students, drawings and notetaking develop their fluency by making them less reliant on computer-assisted texts. Here is an example of one of my student’s drawings on her blog. High tech and low tech, it is all about the learning. Sketchnoting is a good idea. You do this on the iPads then? I was hoping more students had chosen a table alternative. Smart to be able to use handwriting! Hi Ann, in our senior school the students do not have iPads in class, but I like to use Paper53 to do drawings. I recently used the S Pen on a Samsung Galaxy tablet and it was very easy to draw and write with. Also convenient storage for pen in the tablet.